Cleanse. Tone. Moisturize. Then say hello to your new radiant glow. 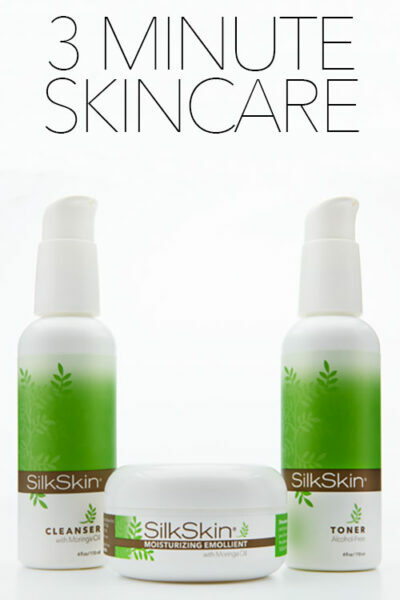 SilkSkin now adds nutrient-rich Moringa Oil to an already dynamic blend of skin-nourishing ingredients. Gentle enough for all skin types. It's your three-minute secret to softer, silkier, younger-looking skin. Fresh. Cooling. Invigorating. After cleansing, SilkSkin Toner helps restore your skin's natural balance before you apply moisturizer. Soothes without over-drying, this alcohol-free based Witch Hazel formula removes all traces of impurities and gently closes pores. Enriched with Hyaluronic Acid to help retain your skin's natural moisture. Hydrated skin is healthier, younger-looking skin. 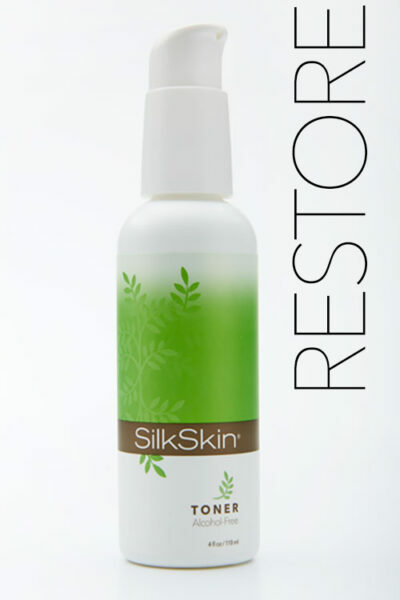 SilkSkin Moisturizer rehydrates, softens and protects your skin against the aging effects of our environment. Now with nutrient-rich Moringa Oil, this advanced formula combines with Vitamin A, Vitamin E, Glycerin, Aloe Vera Gel, Chamomile and Collagen to give you a beautiful soft, silky-smooth complextion. A fast acting protein mask that makes skin feel refreshed and smooth within minutes. DuoMasque reaches deep into your pores to extract impurities and excess oil, tightens pores and lifts away dead skin cells. 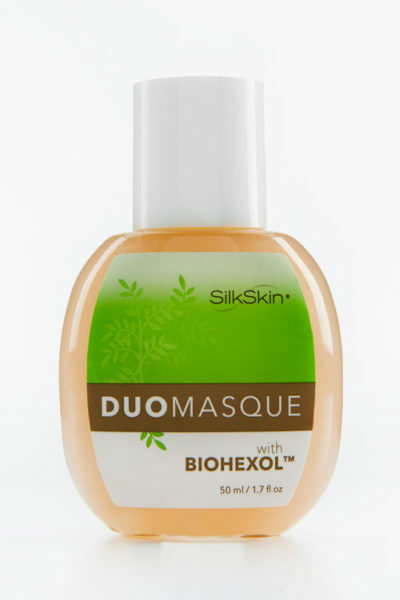 Homeopathic antibacterials help discourage breakouts and makes DuoMasque® ideal for problem teenage skin and adult acne. Ceramide Plus is an effective anti-wrinkle serum that may provide noticeable results after the first use. This anti-wrinkle serum helps to return the skins structure to a more youthful state by restoring the skins ceramides. Once the skin has absorbed the serum, the skin is softer and silkier promoting firmness and elasticity. 60 Capsules. Lift Complex is an incredibly powerful weapon against aging, targeting the areas around the eyes, mouth, and neck. The collagen and elastin-rich formula help your skin regain resiliency, defy gravity and collagen loss while protecting your skin against free radical damage. From the first use, you will notice the difference in the targeted areas as they begin to smooth and become less visible. The formula is absolutely greaseless and non-oily. It's so light you'll never know you're wearing it. Each bottle comes with its own built-in applicator to preserve product purity. 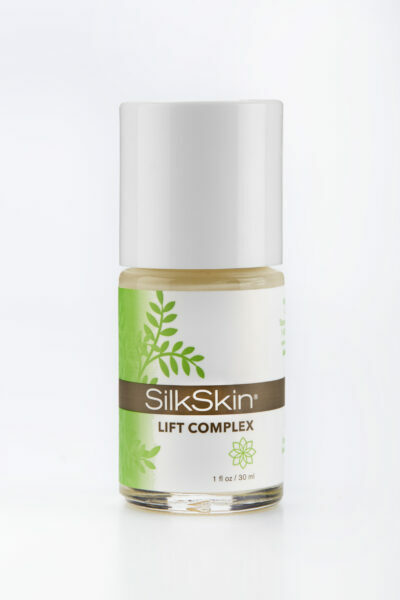 Make Lift Complex a regular part of your daily skincare routine. Help prevent wrinkles while you sleep! The Nightshift is a nightly booster to the SilkSkin System for the skin that needs a little extra hydration and care. Apply Nightshift to the face just before you go to bed and rest assured that Nightshift will be on duty, nurturing and protecting your skin all night long. You will wake up feeling younger every morning with amazing results! Essential ingredients include a unique blend of Elastin, Collagen, Avocado Oil, Jojoba, Royal Jelly Extract, Glucose Glutamate, Vitamin A and Vitamin E. It is designed for someone who is concerned about encroaching fine lines and wrinkles and is too rich for general application to your whole face. Nightshift is hypo-allergenic and safe for even the most sensitive skin.